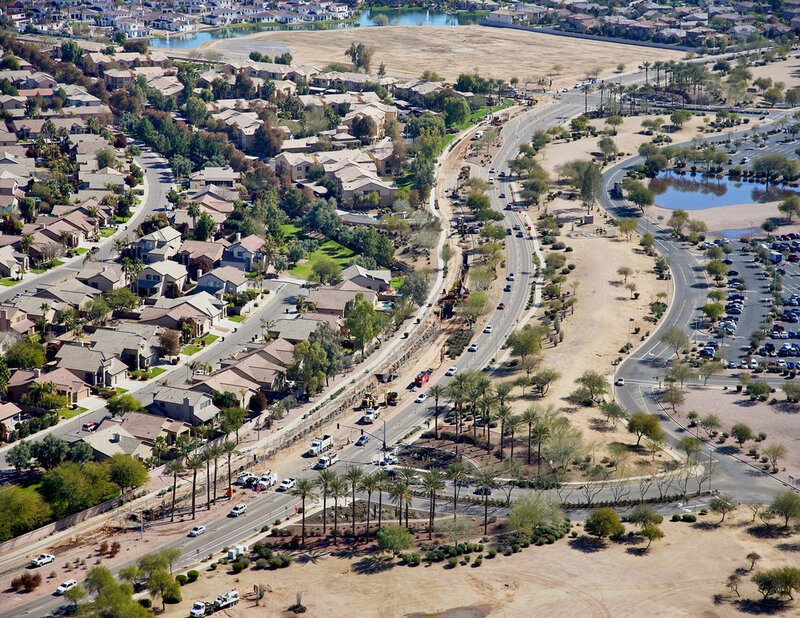 This CMAR project included the construction of more than six miles of new 42-inch diameter high-density polyethylene (HDPE) wastewater force main and five miles of new 24-inch diameter ductile iron pipe (DIP) water transmission main. Both pipelines extend along the Ocotillo Rd. (Dobson Rd. to McQueen Rd.) alignment in Chandler, AZ. The wastewater force main ties into the new lift station at Chandler’s Ocotillo Water Reclamation Facility near Queen Creek Rd. and Dobson Rd. and extends along Ocotillo Rd. to the Airport Water Reclamation Facility west of McQueen Rd. The water main ties into a water line near Intel at Dobson Rd. and Ocotillo Rd. and extends along Ocotillo Rd. to McQueen Rd. The project included installation of manholes, valves, and six jack and bore crossings at utility-congested intersections as well as the Union Pacific Railroad crossing and Consolidated Canal crossing.